Here’s one surprise 10-year-old Cheyanna Prelesnik will remember for the rest of her life. 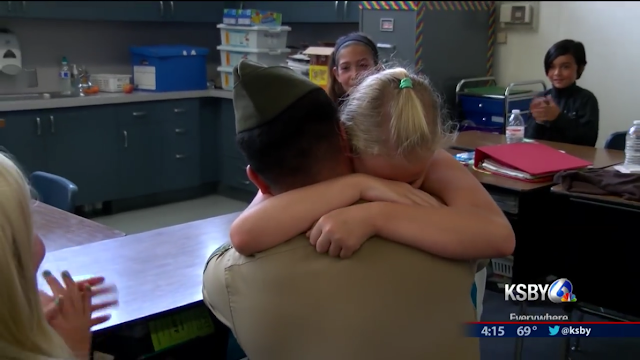 It was the last day of 4th grade for Cheyanna, a California girl who hadn’t seen her brother Brandon in more than seven months. Serving his country abroad – most recently in Japan and Korea – Brandon hasn’t been able to see family back home often since he enlisted in the Marines four years ago. The Sergeant told a local NBC affiliate that the last time the two really got to spend time together, Cheyanna was in a car seat. It isn’t a surprise, then, that 22-year-old Brandon wanted to surprise his little sister with something special the next time the two saw each other. Cheyanna had written her brother a letter, telling him how amazing it would be if he could come back and surprise her at school, Harloe Elementary. She gave him her room number and her teacher’s name, even though she thought it would never really happen. His deployment overseas was long, and she knew the timing made it nearly impossible. That just made what actually happened that day even more incredible. Watch the reunion for yourself below…and make sure to have a few tissues handy.